I'm eating less and drinking more. Simple herbal tea. 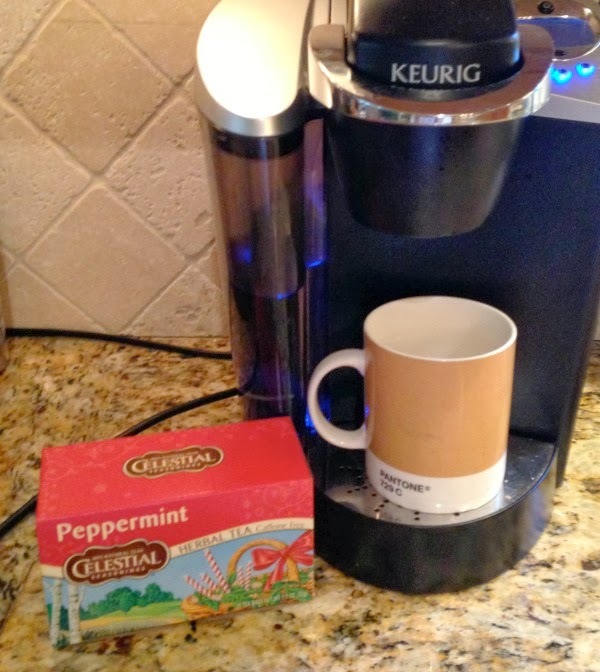 Nothing too fancy--my favorite so far is Celestial Seasonings Peppermint, which costs about 10 cents per cup. I simply use my Keurig as a hot water dispenser--no muss, no fuss. What I've discovered is that sometimes when I think I'm hungry, I'm actually thirsty. A drink of water is always good, but these cool days I often want a hot drink. Herbal tea is the perfect thing to satisfy. And I've found that having a cup of tea in my hand makes for just the right state of mind, too. You can't run around madly when you're holding a cup of hot tea. It's more of a sit-quietly-for-a-few-minutes kind of drink. And those few minutes of quietness are definitely good for my soul. Are you a tea drinker? If so, what's your favorite variety? Please share! This post is the twenty-fifth entry in a 31-day series: Caring for Myself Body and Soul. Richella, I do like hot tea and drink it occasionlly...usually on a very snowy, chilly day, of which you know we don't have very many of the snowy ones around here :) For some reason, it just tastes better then. I like the Rasperry Zinger! I am not a coffee or tea drinker but a hot cocoa and hot cider drinker. Which would probably be worse than having an afternoon snack. But I love hot cider this time of year! I'm definitely a tea drinker. I had to give up coffee (too much caffeine) I have at least two cups of tea every day. I actually make two cups of tea with each tea bag. By reusing the tea bag, it's less expensive, but more importantly, I'm not getting as much caffeine in that second cup. :) My favorites right now are all by Bigelow: lemon lift, plantation mint, and constant comment. Hope you're having a wonderful day! I thoroughly enjoy hot tea. My husband thoroughly enjoys coffee. So, the classic hot drink choices are covered in home. :) I really like Twinings Lady Grey and Harney & Sons Paris blend. Thank you for sharing your thoughts with us readers! I need to get back into the habit of drinking more tea again. I've almost finished my orange and spice. I really need to replenish my Sleepy Time (it's almost 1:00 AM) and Tension Tamer. Not necessarily my fave flavors but I surely do need them. The Celestial Seasonings of the season are great flavors for me. Hello Richella, I am also a tea drinker! I have a cup in the morning while doing my devotions. Then I enjoy having a cup around 3:00 most afternoons. I find tea refreshing and calming! I mostly drink Lipton Tea. But I also will have a cup of mint tea often in the evenings. My favorite hot teas are Twining Lady Grey, world Markets Pomegranate and White tea, and Chamomile tea. Oh, I almost forgot Bigelow Green Tea with Peach. Tea is a lovely way to curb hunger and something I often forget to do. My favorite tea is Market Spice from the Pike Place Market in Seattle. Thanks for sharing. This is so true, Richella! This is one of my favorite teas as well!